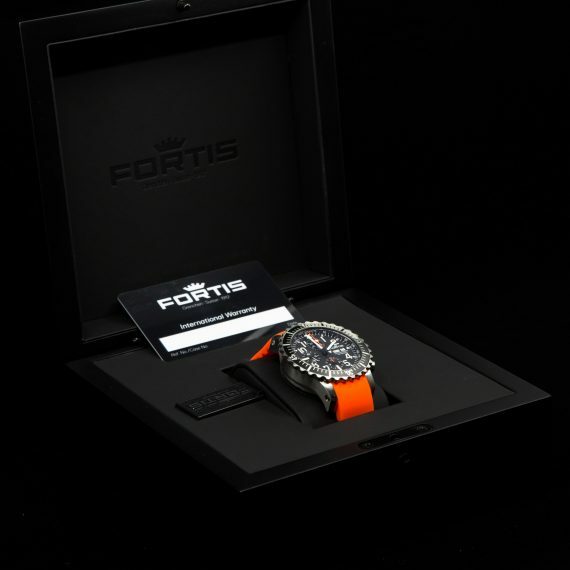 The Marinemaster B-52 by Fortis is a really cool and funky modern chronograph. 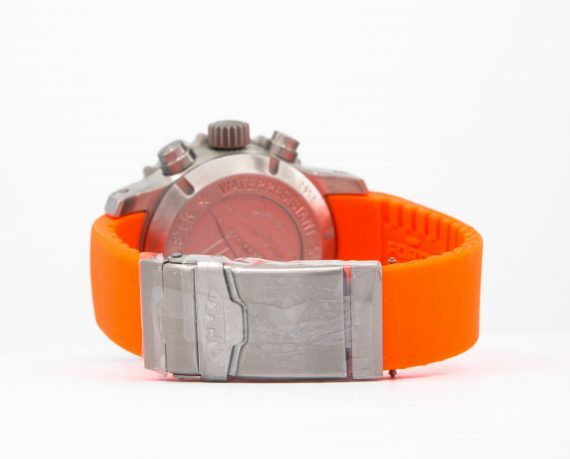 It is made in steel and comes on very bright orange rubber band. The bezel is black with white accents. 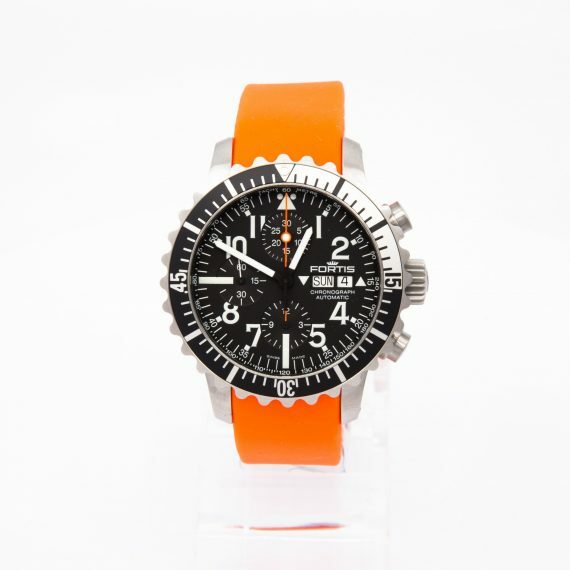 Black dial and with an orange chrono hand . 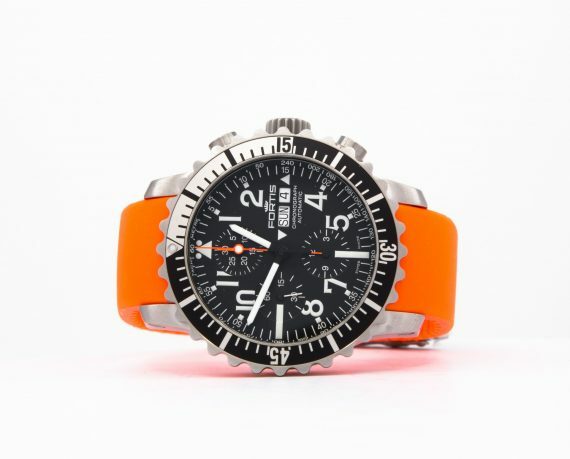 The watch is a chronograph and displays minutes hours and seconds, as well as the day and date – a funky take on the classic pilot chronograph. Our offering is brand new and comes in full set, covered by 1 year of limited warranty from ChronoTimepieces. The prices stated on our Site do not include neither shipping costs, nor handling costs. You are notified of these costs before you place your order. We do provide a flat rate shipping on all orders – 43 € and we ship worldwide via expedited shipping with DHL Express, signed and insured postage only, with an expected time of arrival between 2 and 3 business days. All our orders are shipped within 1 business day of payment clearing. All prices are inclusive of value added tax if applicable, which is shown separately prior to placing your order. Prior to your order, all prices stated on our Site may be changed at any time without advance notice. Please note, that any delivery dates and delivery periods provided by ChronoTimepieces or a contractor appointed by us are merely estimated information and do not constitute binding or guaranteed dates. Orders outside of the European Union are subject to customs duties and/or other taxes. Please check with your local authorities (e.g. customs office) for additional information prior to buying. Import duties, taxes, and charges are not included in the item’s price or in the shipping cost. These charges will occur at your own expense. Please ensure all the information is correct when providing your shipping details during checkout. We may have to contact you if there is any missing information or incorrect data. Delays may also occur due to pending payment verifications or customs clearance. In the case of order not being shipped successfully due to incorrect information provided by you (contact number, address, etc.) or in the case of an unaccepted package, the shipping fees will occur at your own expense. The shipping expenses (and the costs of returning the item/s) will be deducted from the total order sum when issuing a refund. 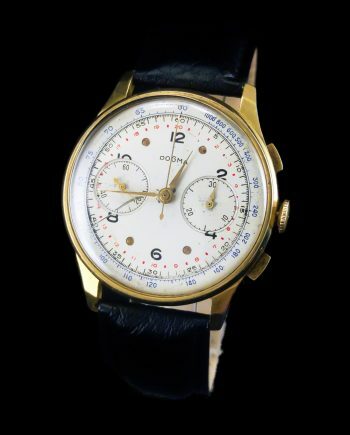 Each item sold by ChronoTimepieces is covered by a no-questions-asked 14 day inspection period, unless otherwise stated in the description of the purchased item. The item, however, must remain unworn and unmolested within that period of time – and in the same condition that it left our offices. If a return is requested, simply email info@chronotimepieces.com and we will respond with instructions. Insured shipping for returns must be paid for by the buyers and buyers assume all risk for it. A before and after video comparison and inspection is required before returns are cleared. The return must be addressed to original address it was first shipped from, unless otherwise agreed upon beforehand. Before returning the order, you must send a written notice (email or physical mail), explicitly mentioning your decision to return the order. In the event of an effective return of order, the price of the purchased item/s will be returned to you. The shipping costs for returning the item will occur at your own expense and will be deducted from your refund. Shipping costs are non-­refundable. The payment will be refunded via the same payment method that had been used by you in the original purchase if not explicitly agreed otherwise with you. ChronoTimepieces will not charge any cost associated with refunding the money. 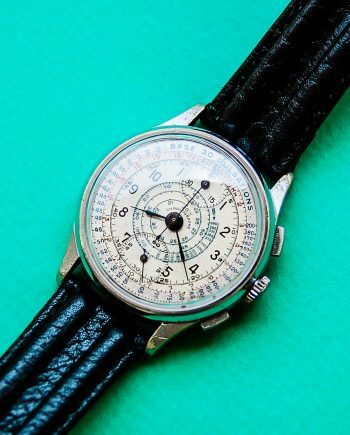 In the case of deterioration of the purchased items, attributable to handling the goods in a manner which goes beyond testing their qualities and functioning, you owe a compensation to ChronoTimepieces. “Testing their qualities and functioning” shall be understood to mean testing and trying out the purchased items in a manner which is possible and usual, for example, in a physical store. For more info, please refer to our Terms of Service. 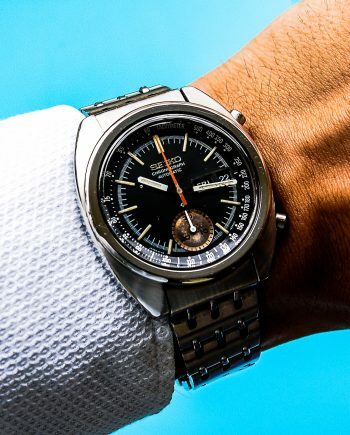 ChronoTimepieces’s service including, without limitation, our website, all information, content and any features made available to you through our Site are provided on an “as is” and “as available” basis. Our directors, employees, agents, partners and content providers do not warrant that the service will be secure or available at any particular time or location. 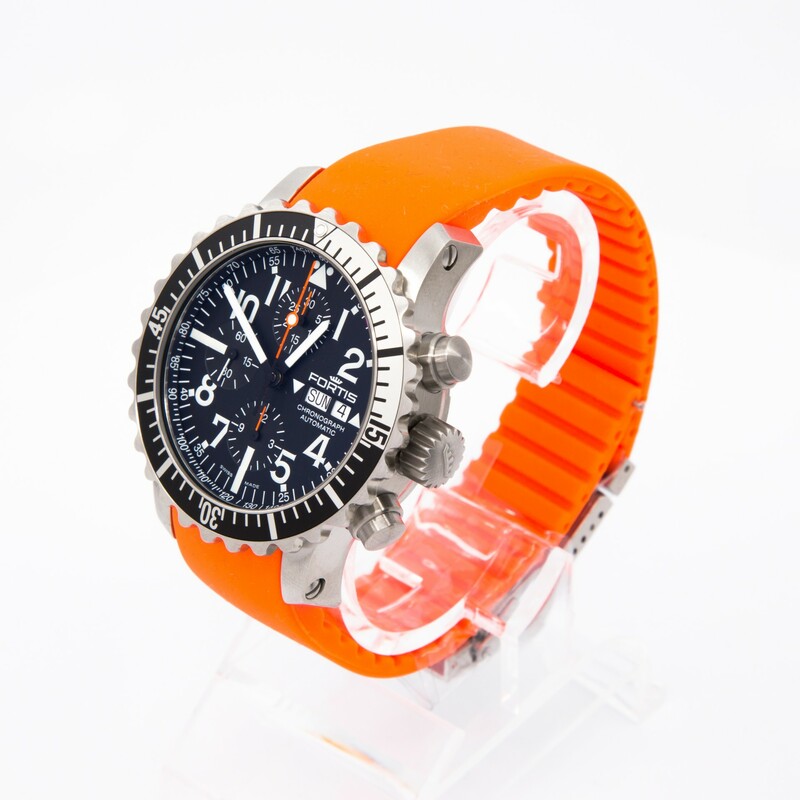 Unless agreed otherwise in an individual case, ChronoTimepieces does not give any guarantees as to the characteristics of the goods which go beyond the statutory warranty rights or any other warranties. All our watches come with a limited warranty of 6 months, starting on the date of purchase. The cover of said warranty is limited to the function, continuous operation and fair timekeeping and it does not cover misuse, neglect, abuse, water damage or any other form of wearer-inflicted damage. Some used watches might still be covered by leftover Manufacturer warranty valid to any AD (Authorized Dealer) – please check the specific description of the watch you are buying. 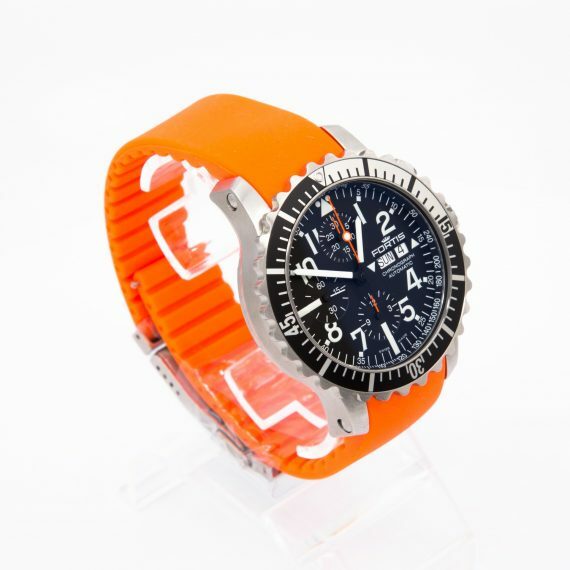 Some new watches might be covered by Manufacturer warranty, usually activated upon purchase and valid to any AD (Authorized Dealer) – please check the specific description of the watch you are buying. 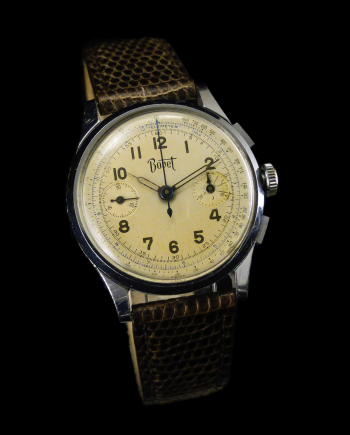 For vintage watches (we consider any watch older than 20 years vintage) time keeping is guaranteed within reasonable limits – ±15sec/day, unless explicitly stated otherwise in the item’s description.